By John C. Toman. Posted November 5, 2011, 7:07 PM. The rain season is off to an early start this autumn, with a winter-like storm dropping between a third and an inch of rain in Southern California's inland valleys. Rainfall was mostly light to moderate Friday morning across the region, followed by light to moderate showers Friday afternoon and evening. Some locations recorded small amounts of rainfall after midnight. It was the second significant rainfall of the fall season so far. The first was on October 5th. 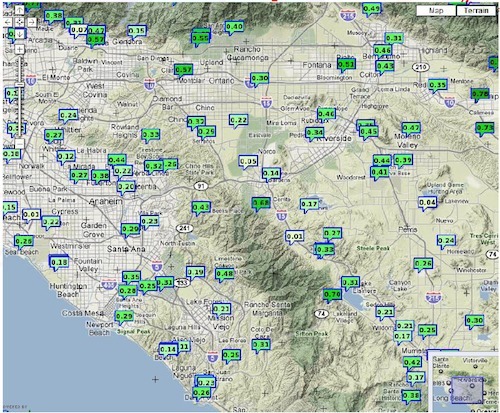 The highest totals for the storm were to the east, in the pass area and in San Jacinto and Moreno Valleys. Totals in East San Jacinto were 0.90" and led all reporting locations. Beaumont was next at 0.75", followed by East Hemet at 0.69" and Moreno Valley at 0.61". Simi Valley, to the west, had the lowest rainfall total at 0.07". At WeatherCurrents' Riverside and San Bernardino County locations, Murrieta recorded the least at 0.20". The rain exceeded forecasts, which were between a quarter and a half of an inch a day before the storm. Rainfall for the season so far was running slightly above normal in Temecula, Murrieta, Lake Elsinore and Menifee, and slightly below normal in Hemet and Fallbrook. Sunday and Monday's follow-on storm is expected to be weaker, with less than a half of an inch of rainfall expected west of the mountains.